Uglyworld #1119 - Deutsches Eck (Project BIG - Image 153-365), a photo by www.bazpics.com on Flickr. Today the weathers was once again scorchings hotter, so much so's that I could gets away with goings outsider in onlies my Scotlanders T-shirter today and getters a bits of a sun-tanner, no needs for a jacketer at alls as we sees high twentier degrees centimagrades here agains. 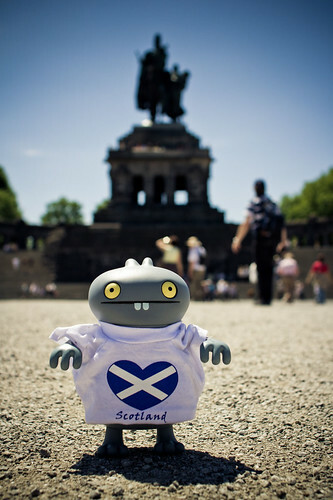 We deciders to takes Scottish Mama to visits the cities of Koblenz in Germanies today, which is arounds an hours and a halfer souths of where we lives in Aachen. One of the coolerest thingies to sees in Koblenz is the huger statue which is behinds me at a place called Deutsches Eck, which I believers means Germanies Corner when you transamalater it into's Englishers. I hopes you all hads good weather todays too and coulds gets outsider and enjoys it!